What we have seen so far from the use of AI has been profound, but there is so much more that can be done with this technology. It’s now more important than ever that businesses operate ethically for both their consumers and those that work for them. This is because there is a growing demand from people who expect more from companies and who want them to understand the impact they have on society. This has led businesses to look towards technology to improve how they operate. I personally believe that the technology that is going to be key in helping businesses do good is Artificial Intelligence (AI). This has led me to invest my personal wealth in a venture capitalist company that invests in startups using AI for good called Rewired. Rewired has helped businesses like Seldon, a company democratising machine learning development. Seldon is making it easier for data scientists, developers and decision makers to manage workflows and provide new capabilities around infrastructure, collaboration and compliance. My investment in Rewired has come after seeing businesses increase their use of AI in the last few years and how it’s helped transform how they work. A report by Narrative Science and the National Business Research Institute found that in 2017 61 per cent of businesses had already implemented AI as part of a strategy to innovate and grow. What we have seen so far from the use of AI has been profound, but there is so much more that can be done with this technology. It has a lot of potential to help change companies for the better. This is because AI has the ability to positively change an individual’s experience, whether they are a consumer or an employee, and this can ultimately have a positive societal impact. Understandably there is a concern that AI will lead to job losses, due to how it has automated some roles in the first implementations of technology, and the opportunities that it can help create have not been obvious to everyone. However, I believe AI actually does the opposite - it helps create jobs. Research by PwC shows that AI will create more than 7 million roles in the UK by 2037. This is because it requires human insight and expertise to succeed and people still value human contact over just interacting with machine and this is unlikely to change even as we embrace AI. All AI is doing is redesigning roles and creating opportunities in new areas. Take for instance in the health sector. The use of AI is growing in this area and it is simplifying some of the most complicated tasks and helping medical professionals save lives. Firstly, there is the da Vinci technique, which is a robotic product assisting surgeons. It is reducing the risk of complications and improving the chance of survival for patients. In addition, there is also Digital Surgery the first AI platform designed to aid surgeons and reduce mistakes. Both of these uses of AI are operated by human beings and help improve a surgeon’s skills. It is not about replacing them, but rather making their job easier to do when it comes to complicated procedures that have previously carried higher risk to life. The implications and the potential this type of technology has is huge. It could really change the health sector and have a real impact on societal health. Healthcare is not the only area where AI is making a difference. When it comes to fraud detection and prevention, AI has been hailed as the technology that will improve it and it truly has the potential to do so. Fintech innovations have made it easier for consumers to connect with financial services and has improved the experiences they have. However, the improvements in financial technology has also made it easier for fraudsters to find new ways to defraud people. Financial businesses have to continuously think about different innovative ways to prevent fraud and AI is helping with this. This is because of AI’s ability to learn and adapt. It can analyse patterns and store data that will make it better at detecting fraudulent transactions. 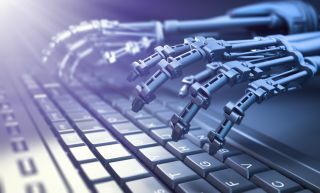 We can already see businesses starting to embrace AI to help with fraud, with the likes of HSBC Bank using Ayasdi’s AI technology to provide anti-fraud solutions. Furthermore, 30 per cent of large financial institutions and 46 per cent of the largest Fintech companies are investing in the technology according to a PwC report. It is clear that it will play an important role in the future. This is particularly important in this sector where consumer trust has been fraught during financial crises and there has been criticism for the way large institutions operate. Businesses should value their customers and do all they can to protect them. It is how ethically run businesses should operate. Another way AI can be used by companies to do good is through training and education. It can help in several ways including personalising the training experience for an individual to get them to be more engaged and to give them the best chance to succeed. Looking after employees and making sure that they are the best they can be is important for their progression and the business overall. Pixelz is a photo editing company that is using AI for just this. The company has created Pixelz Academy, an online training platform that has been developed to train photo editors and improve their technical Photoshop skills. The e-learning tech allows the company to be able to train employees quickly and reliably. Not only is it helping people become more skilled, the clients are getting better quality work as a result. The company has been successful when it comes to the use of e-learning and is a great example of how AI is helping. Good customer service is also increasingly important as the digital world grows. Consumers expect to be heard and rightly so. An ethical business should not ignore its customers and should be able to address any concerns. Businesses have started to look towards AI to help in these areas and are embracing chat bots and intelligent assistants for this. A survey by Spiceworks showed that 40 per cent of large businesses are looking to implement one or more intelligent assistants or AI chat bots by 2019. Chat bots and AI assistants help businesses efficiently and accurately help customers. Businesses like Dominos have successfully introduced them and we can expect to see more in the future as the technology gets better. It’s now more important than ever for businesses to do good. Helping improve experiences for both consumers and employees is very important. AI has the ability to help businesses with this and should be embraced. Current concerns about AI should be addressed, but ultimately it can help create opportunities for all and leaders need to recognise the impact it can have. I believe it is key in helping businesses operate ethically and overall have a positive impact.